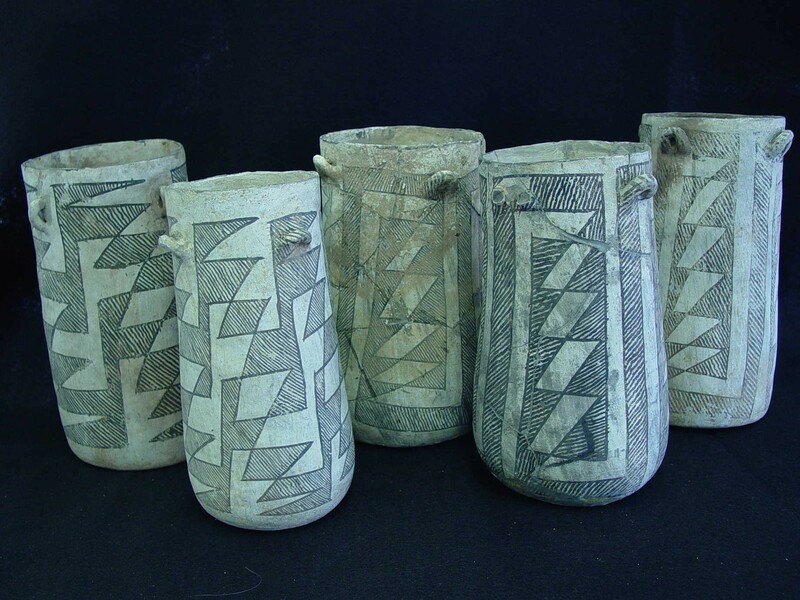 Five cylinder jars from Pueblo Bonito. Catalogue Nos. H3414, H3229, H3406, H3415, and H4153. Courtesy Patricia Crown, from the collections of the American Museum of Natural History, photograph by Marianne Tyndall. In 2009, University of New Mexico professor Patricia Crown and her collaborator Jeffrey Hurst published an academic paper detailing a remarkable archaeological discovery: evidence of a vast trade network, extending from Northern New Mexico to Mesoamerica, that existed as early as the tenth century A.D. In New Mexico’s Chaco Canyon, Crown had located the first evidence of chocolate consumption north of what is now Mexico. 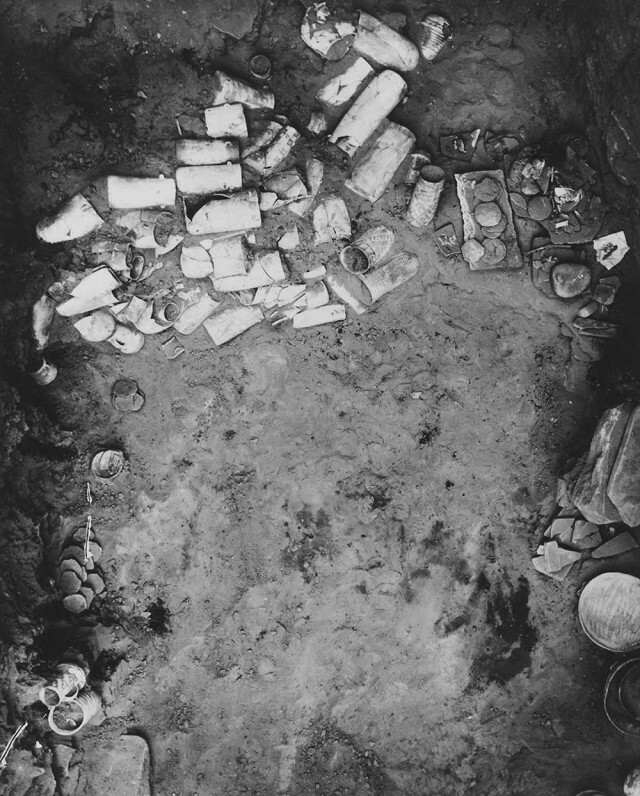 The NEH, which had funded Crown’s research into ancient Southwest pottery in the past, provided her with another grant to explore the Chacoans’ religious rituals and culture, specifically through an investigation of Room 28 in Pueblo Bonito, a room that had been excavated in the late nineteenth-century and then filled back up with dirt. Room 28 had once held 112 cylinder-shaped pottery jars used for drinking chocolate. Students screening backfill from Room 28 through windowscreen because of small size of beads found; note turquoise and shell beads in his hand. Photograph by W. H. Wills. Image courtesy of Patricia Crown. View of Room 28 excavations from mesa top looking south toward Pueblo Bonito. Photograph by W. H. Wills. Image courtesy of Patricia Crown. After she received permission to excavate the room from the National Park Service, NEH funds enabled Crown to hire six students to work on the dig, a security guard to watch over it, and small businesses that helped with the analysis and mapping. 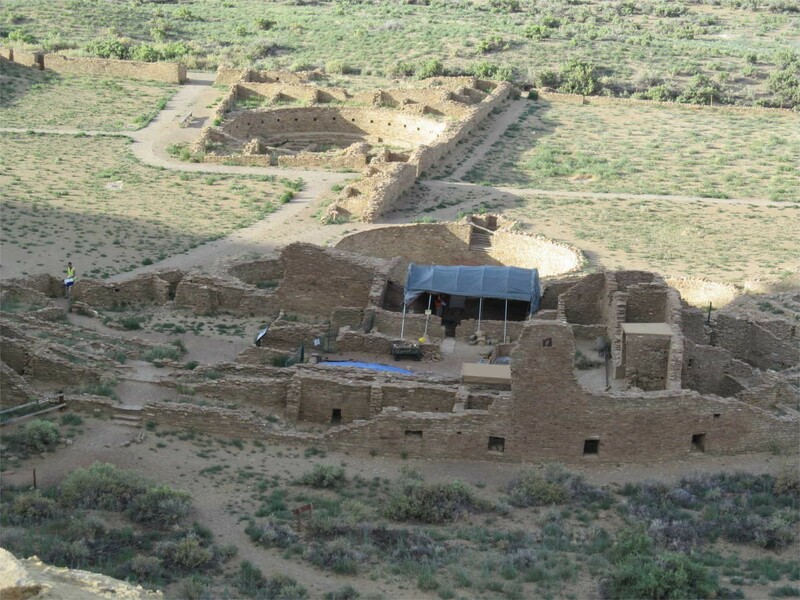 In addition to learning a great deal about the room itself, which had been purposely burned by Pueblo people in about 1100 A.D., she discovered that the Victorian archaeologists who had initially excavated the room had also used it as a dumping ground. Crown and her team found thousands of new artifacts, including pieces of pottery and turquoise and shell beads, all of which are now part of the Park Service collections and will be incorporated into the exhibition area at the park. 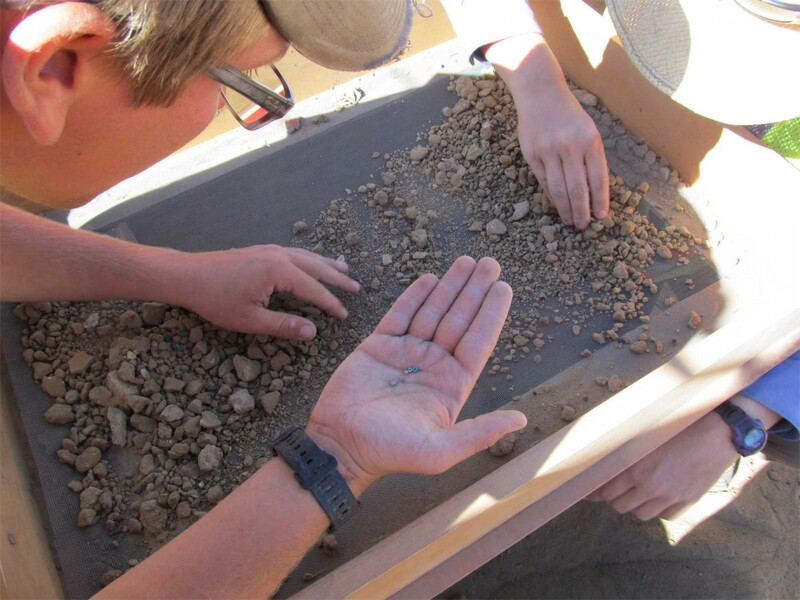 Student crew screening dirt excavated from Room 28 at Pueblo Bonito, June, 2013. Photograph by Patricia Crown. Students crouch behind wall to avoid being mapped into LiDAR. Photograph by Patricia Crown. 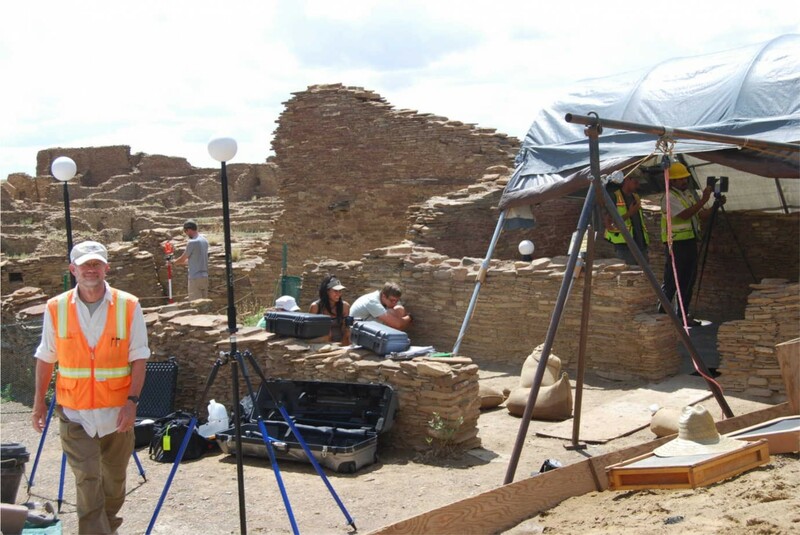 Describing her time in Chaco Canyon as “the most amazing project I have ever done,” Crown focuses on Chaco Canyon as a place where cultures and peoples intersect both now and in the past. Chaco Canyon is a significant tourism site in rural New Mexico that attracts visitors from all over the United States and the world. 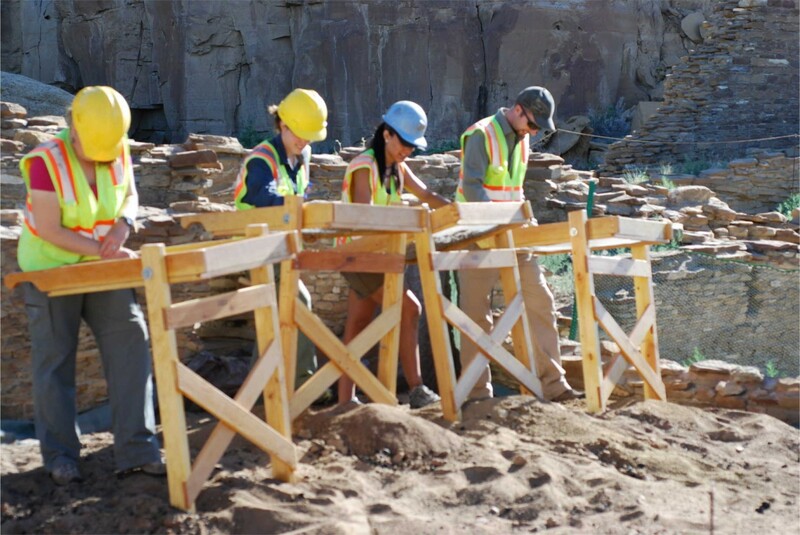 During her six-week excavation, Crown and her team interacted with thousands of people who were visiting the Canyon. At the same time, her research into the very distant past demonstrates an ongoing movement of ideas, objects, and people themselves from Mesoamerica into the Southwestern U.S.
Cache of ceramic vessels on the floor of room 28 in Pueblo Bonito. Catalogue No. 88.42.14. Courtesy of the Maxwell Museum of Anthropology, University of New Mexico.